30 years ago as a teenager in the home counties photographically it was like the dark ages. My first print of trees catching the light curling up in the developer hooked me, but information was sparse. Grey snow in prints, why is that. Bedroom vapours and dermatitis didn't discourage all manner of grade 4 pursuits. On a local library exhibition feedback form, someone had written ‘too dark’. They were probably right although I hadn’t yet discovered Thomas Joshua Cooper so confidence temporarily waned. The subsequent art school tutors (figurative painters) for a year would chuckle and sneer when I talked about photography as art. If I wanted image feedback I went to see the editor of Creative Camera, then Peter Turner, who offered instruction on turning away from wide angle ‘trick’ photography to a more straight style based on looking. The Creative Camera visit as an 18-year-old changed my direction away from wide angle effects photography and confirmed my interest in the classic 20th Century master photographers. Few photography degree courses existed in the 1980’s and my landscape only portfolio of local woods, didn’t entice offers despite receiving a commendation from the art school tutors. I’d run aground. I switched to people, partly to appease a re-application, setting up a photo therapy workshop for long stay patients in a psychiatric hospital. I chose Derby College after seeing an image by John Blakemore in the prospectus which looked, unlike any photograph I’d seen before in the UK. Each week my flip chart and three students with Cosmic Symbols would be gathered in a Victorian hospital ward. Pretty quickly I discovered my teaching style, more do, less chat. Armed with my Pentax 67 we’d head off to photograph our local surroundings. After several months, a portfolio of people photos had been amassed, never to be published. I decided to re-apply for degree courses, spurning institutions that had previously rejected me. I found Glasgow school of Art and was enthralled by Thomas Joshua Copper’s images but suspected my painting sucked to get in. Instead, I chose Derby College after seeing an image by John Blakemore in the prospectus which looked, unlike any photograph I’d seen before in the UK. Once there I found his teaching of the Zone system excellent, the highlight of technical instruction on offer. Now I knew seven years later, why the snow was grey. The possibilities for creative black and white photography with a medium format camera allied to technique were endless. Instead, I didn’t take another landscape photograph for more than ten years and then only on a handful of occasions…until this summer. In the intervening years I’d paid little attention to landscape photography and now based in Morocco there are few exhibitions to absorb. 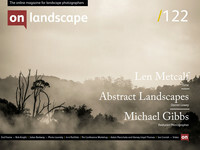 I’d continued as if there had never been a 30-year hiatus; a project unfinished, the abstract landscape. Creative Camera had long since lost interest for me and despite the occasional dip into other magazines in libraries back in the UK, the landscape form that excited me was rarely found, instead urban conceptual seems to have taken over. I’d spend too time on the computer with client photos than to search out others. David Ward had been the only website I’ve been an occasional visitor of in recent years mainly to show students the virtues of format quality, although I also marvel at his creative style. To exclude sky and instead, concentrate on shapes and structures within a small location. Often use DOF to compress space. Fill the frame with interest. Additions to my approach included photographing at dusk to reduce the negative impact of contrast, embracing lens limitations so no focus stacking (instead playing to the limited DOF lenses offer) and include little western perspective. For me, the sky distracts the viewer unless it’s integral to the scene. I’m reminded here of the films of Robert Bresson. Eradicate the superfluous. The advantages of abstract photography far outweigh the limitations. We can practice at less obvious photogenic locations which are often more accessible. Travel to epic locations for many of us requires long journeys and limited time once there. Instead, our local environment can frequently be returned to, and this increasing familiarity can hopefully bring rewards including developing a more personal style. Once the obvious scenic parts of the landscape have been exhausted, you start to look much closer and realise that interest can be found all around. Is there a danger that we begin to see things that are only alive to us and as such viewers will be excluded, possibly. The advantages of abstract photography far outweigh the limitations. We can practice at less obvious photogenic locations which are often more accessible. But then creating in a vacuum without an audience to appease is perhaps the ideal way to develop a personal style. It’s no risk for a non-commercial photographer just an ego bruise. Time away from looking at other photographers doing the same thing may also amount to blasphemy in these parts, but there are benefits from not being overly influenced by peers. Instead look at image makers using different types of locations and using approaches markedly different to your own. A tight-knit community of back slapping can be reassuring but can do doubt influence mimicking of style. The internet has given instant access to millions of potential images, but that access can inhibit as well as inspire. The dark ages were exactly that and thankfully gone. There are now countless accessible high-quality image makers to view, many within this publication, which I discovered after assembling this summer’s photography. My only note of caution is that we seek to plough our own furrows. Looking up Thomas Joshua Copper after 30 years and seeing beyond the 4 or 5 sea and rockscapes I recall, it’s reassuring to see the mark of a distinctive style is still there while the breadth of work has soared. Derby College also left me with one memorable quote. A good photographer can make something 20 feet from their front door.